Wolfson Electrostatics in 2011 (photo courtesy Nupigeco). Every year sees plastics and composite materials being used in place of metal in applications where sensitive flammable atmospheres may be present. Plastic car fuel tanks are now commonplace and the use of polyethylene and fibreglass pipe systems for transporting combustible solvents are employed in a number of industrial processes. Plastics and composites offer a number of advantages over metals such as cost, weight and increased longevity. Unlike grounded metal however most plastics are electrically insulating in nature enabling electrostatic charge, if generated, to accumulate on the surface. In extreme cases the level of charge may build up to a point at which electrostatic discharges (ESD) may occur and this in turn may create a hazard. Many industrial processes can generate static electricity intrinsically. If a flammable atmosphere is also present it is necessary to demonstrate that there is no ignition risk. If it is established that static electricity can be generated, an appropriate and widely used test method to determine whether hazardous ESD’s are possible is that given in Annex C of the European Standard EN13463-1 (Non-electrical equipment for potentially explosive atmospheres). Section 7 of this Standard (Non-metallic parts of the equipment) is also relevant. The Annex C test involves artificially generating the maximum surface charge density on the test piece and then quantifying the magnitude of the resultant ESD’s using an electrical test probe. Provided the discharges are below the appropriate energy threshold, there is no risk of ignition. These tests are routinely performed in the Wolfson Electrostatics laboratories. For further information regarding the introduction of new materials into flammable atmospheres, non-conductive components in fuel handling and interpreting Standards contact Wolfson Electrostatics. Dr Martin Pitt, an established and experienced expert in chemical reaction hazards, joins the Wolfson Electrostatics team. Martin has been involved in training courses for industry since 1976 and was Safety Training Organizer for J. T. Baker Chemicals in the UK and Ireland. He ran courses on industrial chemical safety till 1983, and has carried out a number of company safety audits. 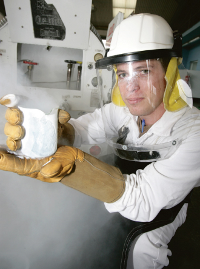 He has been the Assistant Editor of Bretherick’s Handbook of Reactive Chemical Hazards for about 20 years. Martin developed a course in Instrumentation and Process Control at Leeds University which he converted into a successful textbook. He also took over responsibility and further developed a course on Chemical Plant Commissioning, which he continues to run jointly with a colleague at Leeds. In addition he has given individual lectures on safety and incident investigation for Professional Development Courses. 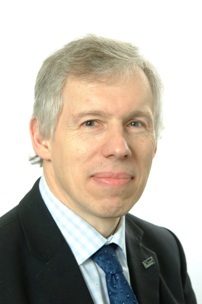 Martin is a longstanding member of the Committee of the IChemE Safety and Loss Prevention Subject Group, and of the organising committee of the “Hazards” series of conferences run by the IChemE. It is envisaged that Martin’s wealth of experience will add significantly to Wolfson Electrostatics portfolio of professional services to industry. 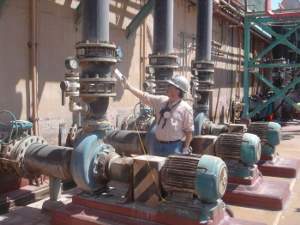 pipelines and isolated metal valves near loaded organic pumps in an SX plant. Low conductivity organic solvent (below 200 pS/m). Frothing or misting of the solvent. Gravity flow (allowing air to be present within the pipe). High solvent flow velocity (well in excess of 2 m/s). Turbulent flow and splashing due to pipeline constrictions etc. Electrically insulating pipework such as HDPE and GRP/FRP. Ungrounded metal components in or on the plastic pipeline. An electrostatic safety audit of the SX plant establishes the degree of hazard present. During the audit a number of electrostatic measurements on the functioning processes should be performed. If a combination of low solvent conductivity and high potentials are observed, it must be concluded that an electrostatic ignition hazard may exist. The above information is taken from the Wolfson Electrostatics publication ‘STATIC ELECTRICITY IN SOLVENT EXTRACTION – Guidance for Plant Engineers’. To obtain the full 12-page guidance document contact Wolfson Electrostatics. The problem of static electricity in commercial offices and stores is a relatively modern phenomenon. It represents an annoying source of painful electric shocks to both occupants and visitors and contributes to low morale amongst staff and workers. In department stores for example it often generates complaints from customers, sometimes resulting in litigation. In a recent incident a cup of hot coffee was spilt on a child after the parent received a shock from a hand rail in a department store café. Uncontrolled static electricity can also cause chaos by interfering with computer systems and electronic point of sales (EPOS) equipment. In the most extreme cases it can even constitute a fire or explosion risk. It is possible for a person to generate electrostatic charge by movement; particularly walking. The contact and separation of the sole of the shoe with the floor creates a small imbalance of charge with every step and this slowly accumulates on the body. The person involved may be blissfully unaware of this condition until they reach for a grounded object such as a hand rail, radiator or lift button whereupon a spark jumps from their finger. In this spark the body releases all of its accumulated charge at once giving the resultant sensation of electric shock. If electrical charge on the body reaches a voltage in excess of about 3,000 Volts (3 kilovolts) it is likely that the person will experience a shock when touching an earthed metal object such as a radiator. At 10,000V or greater most people would consider the shock to be painful and experience involuntary recoil. In virtually every case that has been investigated the prime causes of repeated electrostatic problems in buildings are the material of construction of the floors and the floor coverings. Traditional materials such as wood, natural-fibre carpets, concrete and antistatic-grade vinyl are electrically dissipative. Modern synthetic materials, although generally more hard wearing, are often highly electrically insulating. Quartz tiles, ceramics, epoxy resin, plain vinyl and synthetic carpets fall into this latter category. In many buildings the incorporation of polished steel hand rails exacerbates the problem by providing a convenient grounded metal object for the person to discharge to. Determine the electrostatic properties of the proposed materials well in advance. A specialist laboratory will be able to predict whether there will be a static problem once the building is completed. Do not rule out any generic flooring material (for example ceramic tiles) as there can be a great variation in the electrostatic performance of different varieties. Materials used for the base or underlay may also have a significant effect. Do not rely on claims that a particular product is ‘Antistatic’. Experience has shown that this term is often applied without foundation. Fixtures and fittings such as door handles, hand rails etc are less likely to cause shocks and accidents if made of a natural ‘dissipative’ material like wood. Partially conductive composites are also available which have the advantage of removing the charge from the human body without producing a shock. If static electricity only becomes an issue after the building is completed, the approach becomes one of ‘damage limitation’ rather than a full solution. An electrostatic audit will determine the source of the problem, quantify the properties of the materials and levels of static and recommend the most practical and cost-effective solution. View the full article ‘Controlling Static Electricity in Modern Buildings’ .pdf file (opens a new window). Can static electricity cause unintentional airbag deployment in vehicles? Wolfson Electrostatics in collaboration with a leading car manufacturer has investigated the potential problem of unintentional airbag deployment of passenger, driver and knee airbags on a number of vehicles due to static electricity. The proliferation of synthetic fabrics and mouldings in modern motor vehicles can result in the generation and retention of electrostatic charge (as vehicle occupants may often experience in the form of electric shocks). In particular, the large expanse of non-conductive plastic comprising the instrument panel (IP) and glove compartment on the passenger side can easily acquire relatively high levels of surface charge. The movement of the driver or passenger with respect to the seats has long been recognised as a prime charge generation mechanism. When a person leaves the vehicle they may carry charge of one polarity with them raising their body potential to several kilovolts. Charge of the opposite polarity is retained within the vehicle’s interior. 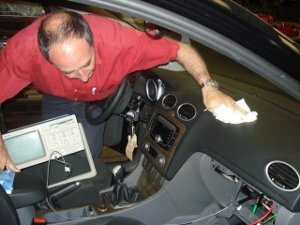 In past studies by Wolfson Electrostatics and other investigators it was found that airbag systems can be sensitive to electrostatic discharge (ESD) and occasionally, as a result of such a discharge, produce an unintentional deployment. The generation of static electricity in motor vehicles is primarily due to triboelectric charging. This is the term given to the static electricity generated by the frictional interaction of two contacting surfaces. It may be between the occupant’s clothes and the car seat, their footwear and ground, a dusting cloth and the IP or the motion of the tyres against the road surface. Synthetic materials such as polymers being highly electrically insulating will usually generate and retain electrostatic charge. An ungrounded metal component such as an airbag module behind a plastic IP may become charged by induction (electric field) or conduction (charge migration from the charged plastic). Consequently it may rise in potential and produce a spark. In respect of charge generation not all materials behave the same; some tend to charge to a positive polarity and others tend to charge negative. As well as differences in polarity, the magnitude of the generated charge may also vary depending on the materials involved in the contact. Triboelectrification is not the only electrostatic property that determines the level of electrostatic activity associated with materials. The property of charge relaxation (how quickly a material can dissipate or conduct charge away) can also have a significant effect. There will be no build up of charge on the surface of materials if they are sufficiently conductive and grounded. To ensure rapid charge relaxation, Standards usually recommend a maximum resistance to ground of between 10 and 100 megohms. In practice resistance paths of up to 10,000 megohms may be sufficient for all but the most extreme situations. Most common plastics used for vehicle interiors are highly insulating in nature exhibiting a resistivity at least four orders of magnitude greater than this. Surface contamination, particularly moisture and salt from human touch can reduce this resistance significantly. This results in a more rapid charge dissipation and may help explain why unintentional deployments happen mostly with brand new vehicles. Tests at the Motor Industries Research Association (MIRA) have also shown that the vehicle itself may accumulate electrostatic charge itself when in motion. In their tests, the average measured vehicle potential was 2 kilovolts with transient peaks of around 8 kV due to changes in road surface. It was observed that once the vehicle stopped, the accumulated potential rapidly dissipated through the tyres (which are generally partially conductive). However in a situation where the vehicle comes to rest on an insulating surface such as a filling station forecourt or car park pay barrier, the charge on the vehicle could be retained. A full-scale experimental test rig designed by Wolfson Electrostatics in collaboration with safety experts and engineers from the petrochemical industry has been assembled at Cookson & Zinn, the tank manufacturing company in Suffolk, UK. The test facility simulates a filling station layout – in particular the conditions existing during road tanker delivery. Electrostatic test facility for forecourt fuels. The use of electrically insulating synthetic materials, such as plastics, for fuel pipelines and other fuel handling components is now widespread. In the case of buried pipelines at roadside filling stations, the use of these materials offers superior corrosion resistance and increased longevity over metal. It is well reported however that the flow of fuel under certain conditions in plastic pipes can produce measurable levels of electrostatic charge. 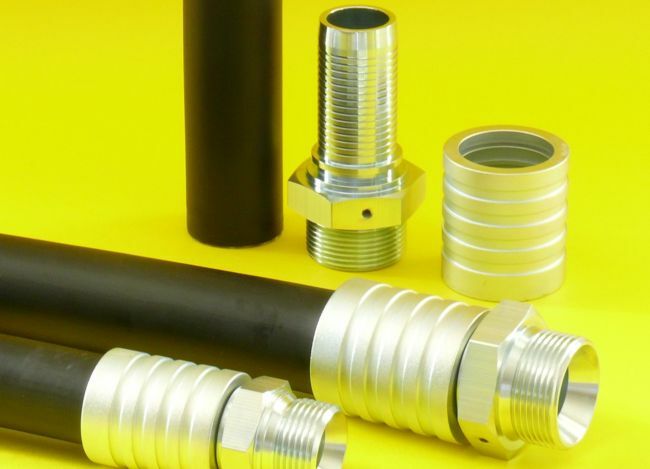 Pipe systems in modern filling stations generally contain both plastic pipe lengths and metal components such as valves and couplings on which electrostatic charge can develop. The objective of the test facility is to determine existing margins of safety with existing and new-generation fuels. Two pipe circuits; 63mm and 110mm running roughly in parallel with buried and exposed sections and incorporating a series of straight and elbow couplers. Two clean stainless steel 1.5m3 fuel tanks for storage of test fuels. Diaphragm pumps to draw fuel from the storage tanks through the pipe circuit. Open test chambers at the input and output points of the pipe circuit containing, valves and couplings and enabling electrostatic measurements to be made at these key points. A length of proprietary tanker hose joining the fuel tank to the input of the pipe circuit to exactly simulate fuel delivery. 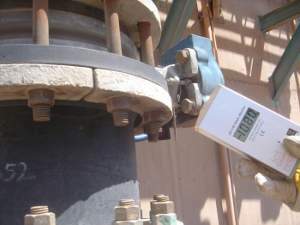 Monitoring of flow readings together with total fuel transferred. Continuous output signals from electrostatic instrumentation to capture the presence of electrostatic discharges at high potentials. Small electrodes fitted to pipe couplers to enable the electrostatic potential to be measured at these points. Sampling point in the manifold to enable measurement of liquid conductivity. 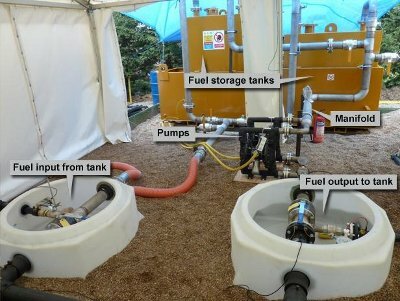 Two test fuels have already been examined: Fuel C (a ‘pure’ form of gasoline comprising roughly 50/50% by volume of Iso-octane and Toluene) and White Spirit, a light oil similar to aviation fuel. Based on previous work, both fuels were suspected of producing high charging. In April 2010, the operation of the test facility was witnessed by a delegation from the fuel retailing regulatory authority of the Peoples’ Republic of China. A short video presentation of the tests will soon be available. A 15-page report can also be obtained by contacting Wolfson Electrostatics. The report describes the operation of the test rig, operating parameters and presents data from a series of runs. It also draws conclusions with regard to current safety margins and precautions for continued safe operation with non-conductive pipe and fuels. Although liquid oxygen (LOX) is non-flammable it can have a dramatic effect on the ignition energy and burn rate of materials. Common fuels and solvents for example can be 100 times more sensitive to ignition by the presence of enriched oxygen (over normal air) and therefore static electricity becomes a major concern. Other materials such as oils and grease, clothing fabrics and even metals may not normally be considered as ignition risks, particularly with regard to static but may ignite and burn violently in a LOX environment. Liquid oxygen is used extensively in aerospace, submarine and gas industries and under certain conditions during handling, a flammable atmosphere sensitive to ignition by electrostatic discharge (ESD) could exist. Due to the effect of an enriched oxygen atmosphere on flammable media it is difficult to quantify ignition energy thresholds. As a consequence, the avoidance of ignition must rely on the elimination of all electrostatic discharge sources. Any electrostatic discharge irrespective of its energy content must be considered as presenting an ignition source. One concern recently investigated by Wolfson Electrostatics centred on the potential generation of electrostatic charge on personal protection equipment (PPE) used in LOX handling at a military base. Such equipment includes aprons, gloves, overalls and visors. The rate of charge generation can be monitored during normal operations and procedures but is difficult to predict if unusual circumstances arise. Generally it should be assumed that operations involving rapid and energetic movement and the contact and separation of surfaces may produce high levels of static and possibly electrostatic discharge. As in many situations involving flammable media there are principally two types of electrostatic discharge (ESD) that need be considered from the point of view of ignition hazard; sparks and brush. Sparks are responsible for the majority of industrial fires and explosions caused by static electricity. Spark discharges will occur from conductive objects, surfaces and personnel, which are ungrounded and have become charged to high potential. Sources of spark energy will comprise items such as ungrounded metal fixtures and fittings. They may also include personnel if their footwear and/or the flooring are electrically insulating. Mobile and non-fixed items such as trolleys, metal drums, gauging equipment and hand tools are also potential spark sources. Typical spark energy levels encountered in industrial processes lie in the range 1-100 millijoules (mJ). This form of discharge occurs from charged non-conductive surfaces such as plastics and may even occur from highly charged non-conductive liquids such as hydrocarbon solvents and fuels. The ignition hazard presented by a brush discharge depends on a number of factors but the energy content is limited to a theoretical maximum of around 4 mJ. In many situations this lower energy limit makes brush discharges less hazardous than sparks. In an enriched oxygen environment however brush discharges can present a serious ignition risk. For example, with regard to LOX and the ignition of textiles, recent work  indicates that spark energies in excess of around 4.8mJ are required to ignite certain clothing materials in a pure oxygen environment. With other more sensitive flammable media, the ignition threshold may be lower and therefore the risk posed by brush discharges should be addressed. For further information on the Dangers from Static Electricity in Liquid Oxygen (LOX) handling please contact Wolfson Electrostatics. Wu et al., ‘Research on ESD Ignition Hazards of Textiles’, J.Electrostatics 57 (2003) 203-207. After suffering two major fires attributed to an electrical ignition source, Australian mining giant, WMC commissioned Wolfson Electrostatics to undertake a continuing investigation into the cause of the fires and to advise on mitigating measures to ensure future safe operation. Both fires occurred inside the solvent extraction plant at WMC’s Olympic Dam operations in the South Australian outback. Spark ignition of kerosene 'foam'. The investigation by Wolfson has incorporated an initial analysis of electrostatic ignition hazards associated with the process that uses hundreds of thousands of litres of combustible solvent during ore extraction. A technical review of the process and procedures together with on-site measurements have already been undertaken at the Olympic Dam mine. A second phase of the project was undertaken recently at the Wolfson Electrostatics Laboratories at Southampton University to determine under what conditions the solvent can be ignited with a low energy source and to quantify the levels of static electricity generated in the extraction process. One of the most important findings was the ease at which solvents such as kerosene can be ignited below their flashpoint under certain conditions within pipe work. It is envisaged that the results of this investigation will lead to the publication of a code of practice specifically related to the avoidance of static electricity and other electrical ignition hazards associated with solvent extraction. For further information on static electricity in industrial processes contact Wolfson Electrostatics. Research by Professor John Hughes and Dr Lindsey Gaunt of the Bioelectrostatics Research Centre at Southampton University has led to the development of a new generation of electrostatic aerosol sprays. The charged sprays are attracted to surfaces and objects, substantially enhancing the performance of the product. The technology was originally developed for use with aerosol fly sprays, whereby the charged droplets are attracted to flying insects, such as houseflies and mosquitoes. Faster rates of insect paralysis and higher mortality are the result. Many other domestic applications for the technology are now being considered. This ‘Smartseeker Technology’ offers many advantages over conventional sprays as the droplets emitted from the nozzle reach their target more rapidly and efficiently. The electrostatic charge means the spray has ‘wrap-around’ capabilities, giving coverage to those hard-to-reach places. More accurate coverage also means there is less wastage, offering a more environmentally sensitive delivery system. The electrostatic technology exploits the natural process of shearing interfacial electrical double layers that occur during liquid atomisation. 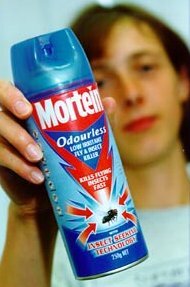 On its commercial launch in 1999, ‘Smartseeker Technology’ became the first passively charged aerosol spray in the world, before receiving the Design Council Millennium Product Award in 2000. Building on the success of the Smartseeker, the concept of passively charged sprays has recently been extended and adapted to create a two-stage charging system for trigger actuated devices. The first stage of the process involves tribocharging (frictional charge generation) between two components of the trigger mechanism. Charging of the product is simultaneously achieved as the liquid is atomised in the high electric field created by one of the tribocharged components. Using this technology, effective targeting and wrap around characteristics can be conferred to just about any aqueous spray. These developments which can confer numerous efficiency advantages and additional functionality without the need for a power supply have many potential benefits. The fact that the droplets are charged and attracted to the target is relevant to a range of applications from industrial coatings to deposition of pharmaceuticals. For further information on smartseeker Technology contact Wolfson Electrostatics. Automatic sorting of waste packaging. Work at Wolfson Electrostatics, looking at practical means of identifying materials particularly plastics for recycling, is generating increased interest as international legislation and directives come into play. Currently, electrostatic and optical techniques are being considered for a range of recycling applications. Most recently the PolyAna system, which uses infrared spectroscopy, was incorporated successfully on a computer monitor recycling line at Wayland Prison in East Anglia. A project sponsored by the Onyx Environmental Trust has resulted in the development of a pilot scale separator for waste plastic packaging. 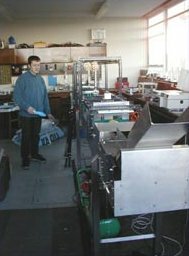 The separator, which incorporates a 5 metre long conveyor, has been built in the Wolfson Electrostatics Laboratories in the University of Southampton and has undergone successful trials. The separator unit sorts plastic packaging items according to their polymer group by using ‘triboelectric probes’. These probes, which make frictional contact with the packaging materials, measure the electrical properties of the plastic. Once the polymer has been identified the items are automatically ejected from the conveyor line at different points into separate collection bins for recycling. Continuing on the subject of plastics identification, Wolfson Electrostatics have recently received a grant from the Shanks First Fund to develop further technology to assist in the important function of material identification prior to recycling. Identifying materials, particularly plastics, prior to recycling is currently considered the weak link in the recycling chain. The work financed by the funding from Shanks First is enabling Wolfson Electrostatics to develop and refine practical plastic identification methods and two prototype bench mounted identification systems have been built. The Ford Motor Company is providing the industrial perspective although it is recognised that automotive recycling is only one of many areas, which will benefit from this technology. For further information on Plastics Recycling contact Wolfson Electrostatics. 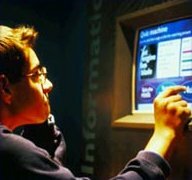 The new PolyAna plastics identification system developed in a collaborative project between Wolfson electrostatics and the Ford motor company will become a permanent working exhibit in the Challenge of Materials gallery located on the 1st floor of the Science Museum in London. The PolyAna exhibit will enable visitors to the Museum to identify a series of plastic test panels. The identification process takes a few seconds after which the name of the plastic and the estimated accuracy of identification are displayed on a screen. The gallery in which the PolyAna is exhibited is described by the Science Museum as a display of world-class new technologies. Each display focuses on a single contemporary technological object or product. At the Wolfson laboratories, plastics identification technology is continually being updated resulting in the latest-generation PolyAna Avatar. This instrument is now commercially available from Wolfson Electrostatics. For further information on Plastics identification technology contact Wolfson Electrostatics. Testing an FIBC with the gas ignition probe. The use of flexible intermediate bulk containers (also known as FIBCs, big bags, jumbo bags, etc) has increased enormously throughout manufacturing industries where large quantities of powdered, granular or pelleted materials are handled. The bags are cubic or cylindrical in shape and may hold up to 1.5 m3 of bulked product. 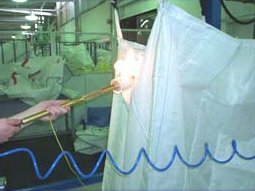 Many processes, for which big bags are used, may contain sensitive flammable media such as solvent vapours or dust clouds with low ignition energy. It is now well recognised that these bags which are traditionally manufactured from woven polypropylene can generate high levels of static electricity when filling and discharging and as a consequence, efforts have been made by FIBC manufacturers to design bags, which are inherently antistatic. ATEX directive 137, on minimum requirements for improving protection of workers potentially at risk from explosive atmospheres, was required to be implemented by member states of the EU by the end of June 2003. Since part of this directive is the avoidance of the ignition of explosive atmospheres, compliance with ATEX requires the use of an effective ‘antistatic’ FIBC in operations where flammable atmospheres cannot be ruled out. A number of FIBC manufacturers around the world are now turning their attentions to developing the so-called Type D antistatic bag. In this case the fabric comprises woven polypropylene for mechanical strength but is chemically treated in order to modify its electrostatic properties. In addition, antistatic or partially conductive threads may be incorporated into the weave. The advantage of a Type D antistatic FIBC is that by careful design, incendive electrostatic discharges from the fabric surface can be ruled out. An electrostatic safety audit on this type of FIBC has been developed by Wolfson Electrostatics and is often requested by potential customers wishing to use big bags safely in zone 1 and other hazardous environments. The main approach of the Wolfson Electrostatics audit test is to attempt a controlled ignition of a sensitive propane/oxygen/nitrogen atmosphere during filling and discharging the bag with highly charged polymers. A special gas ignition probe has been developed for use in the test and FIBC designs from Europe, East Asia and Australia have been appraised. Footnote: Type D antistatic FIBCs are designed to be static safe from the point of view of electrostatic discharges from the fabric surface even when used unearthed. It is appreciated, however, that if a sensitive flammable atmosphere exists, the FIBC itself is only one potential source of electrostatic ignition and full antistatic precautions should be taken on all materials within the atmosphere. For further information on FIBC safety contact Wolfson Electrostatics. Can shocks from static electricity damage your health? Static electricity - a common nuisance. Modern buildings are inherent static generators and dry, fine weather often brings complaints of electric shocks from people touching radiators, door handles, filing cabinets and hand rails. Whether it is a new car, a new office or the interior of a department store, the question is often asked, can repeated shocks from static constitute a health hazard? On the face of it one might expect static electricity to pose a lethal threat. The voltages encountered may be as high as 15,000 or even 20,000 volts, whereas mains supply voltages of only 240 volts are known to be fatal. Furthermore, the destructive nature of static electricity is vividly demonstrated in nature by a lightning strike, itself an extreme form of static discharge. In the office, car or store, however, we do not encounter lightning-like discharges and what determines the severity of the electrostatic shock, in most cases, is the amount of electrical charge that is generated and stored on the human body. When a person reaches for a door handle and experiences an electric shock it is the release of electrical energy developed on their body by actions or movement prior to touching the handle. The charge may be generated by a very simple action such as walking across a carpeted or tiled floor. The electrical shock that is experienced occurs when the body loses its stored energy very rapidly in the form of an electrostatic discharge (ESD). This ESD can be characterised in terms of parameters which include the discharge energy, electrical current and duration of current flow. Electrical energy that can be stored on the human body and then released in an ESD is measured in milljoules (mJ) and is governed by the capacitance of the body (C) and the potential or voltage attained (V), according to the formula E = ½ CV2. The capacitance of a person standing will usually lie in the range 100-300 picofarads (pF) and human body potentials in excess of 20,000 volts are unlikely to occur. Taking the maximum in each case, yields an energy level of 60 mJ, this represents a relatively small amount of energy compared with say a household light bulb which consumes a 1,000 times more energy every second. The electrical current flowing during an ESD can be measured on a fast response oscilloscope (see photo). This quantifies the other two important characteristics of an electrostatic discharge - a relatively high current which maybe several amperes dissipated within a fraction of a microsecond. The effects of electrical current passing through the human body are covered at length in the International Electro Technical Commission document IEC 479-2:1987. In this document it indicates that a transient or capacitive discharge, as is the case with static electricity, requires energy in excess of 5 Joules (5000mJ) to produce a direct serious risk to health. Although it is practically impossible to store this level of electrostatic energy on the human body, case histories have shown a number of accidents due to shock reaction. Such accidents include falling from ladders, involuntary recoil and dropping or releasing loads. Footnote: In some industrial processes, discharges of several Joules due to static electricity can occur under extreme conditions. In such cases the static charge accumulates not on the human body but on highly polarised materials where the effective capacitance is very high. These situations can give rise to extremely energetic discharges resulting in severe physiological effects. For further information on the effects of static electricity on health contact Wolfson Electrostatics.